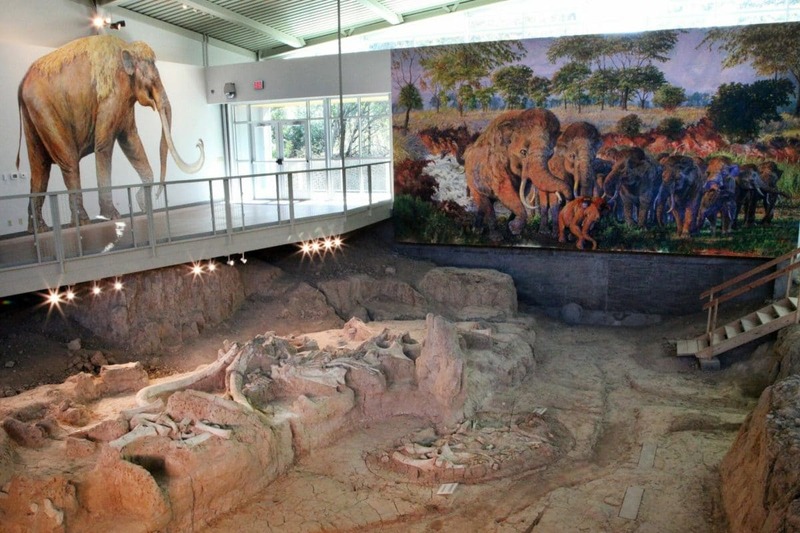 paleontological site and museum featuring the fossils of 24 Columbian Mammoths and other mammals from the Pleistocene Epoch! Talk about exciting! Sitting along the Bosque River, this gorgeous area was a common ground for hiking, wildlife watching, and arrowhead hunting, the latter of which happened to be the activity taking place in 1978 when the first fossil was stumbled upon. From 1978 to 1990 the area was excavated, some of the remains even left in the spots they were originally found (in situ). You will see the remains of a female mammoth, Bull mammoth, a dwarf antelope, American alligator, saber-toothed cat, and even a 67,000-year-old camel! As a matter of fact, all of these remains are from about 65,000 to 72,000 years ago. While not 100% certain, it is believed by researchers that these mammoths died in a single major event, most likely being flooding. Start your visit at the welcome center then follow the 300 yeard path down to the Dig Shelter. Guided tours and field trip options will be available, the presentations lasting anywhere from 45 minutes to an hour. Students will be able to dig, view an exciting film at the onsite amphitheater (Ice Age Megafauna), and learn all the differences between archaeology and paleontology.